Anna Sui Fashion Designer Guide - Directory of Anna Sui Fashion News, Anna Sui Design Photos, Anna Sui Videos, and much more. Anna Sui is an American fashion designer from Detroit. Her brand categories include several fashion lines, footwear, cosmetics, fragrances, eyewear, jewelry, accessories, home goods and a gifts line. Visit the official Anna Sui website. You can learn more about Anna Sui in the fashion designer definition section. You can utilize the discussion area below to meet other members of the fashion industry, and discuss information about Anna Sui. Please keep the communication specifically about this fashion designer or the companies that are directly relevant to the brand. 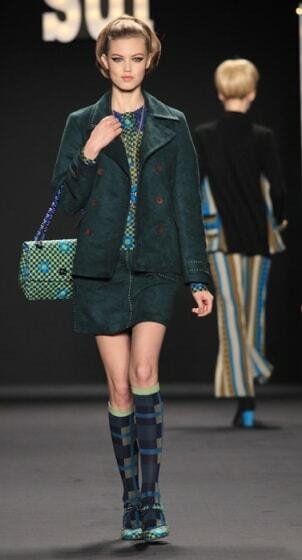 Do you like Anna Sui? Apparel Search guide to Anna Sui photos, Anna Sui videos, Anna Sui news, Anna Sui blog posts and more... If you are interested in fashion and style, you will be interested in Anna Sui.